Since the early August National Sports Collectors Convention in Baltimore, a steady flow of convention exclusive cards have found their way onto the secondary market, with most of them selling for less than they probably should. Whether it be the 1991 Stadium Club Super Bowl Exclusive Brett Favre RC or the 1992 Derek Jeter Stadium Club Murphy RC, promotional cards from major card companies have found major value over the years. 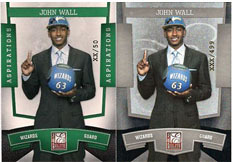 Rarely do big name rookie like John Wall have cards on the market made by major card companies prior to the release of a season's first major product. Last month we looked at the potential investment value of LeBron's Donruss Elite National Convention Exclusive cards, which were the first major cards to feature King James in a Miami Heat jersey. This month, we'll take a look at how John Wall's National Convention Exclusive 2010 Donruss Elite and 2010 Panini Certified cards are fairing on eBay. Below are the top 10 highest recent sales for each card, both of which seem to flying under the radar at the moment. Recommendation: You can't go wrong with one of the lower numbered Certified versions, if at all possible hold out for one of lower numbered Donruss Elite versions.